I seldom take some photos on sunrise unlike when it's sunset which for me can be easy because I find waking up early as quite uneasy. But this can be new activity for me and that means a different perspective taking some shots before the sun begin to rise. The same endeavor but different time, and a new location that I can go since sunrise is an opposite direction to sunset. 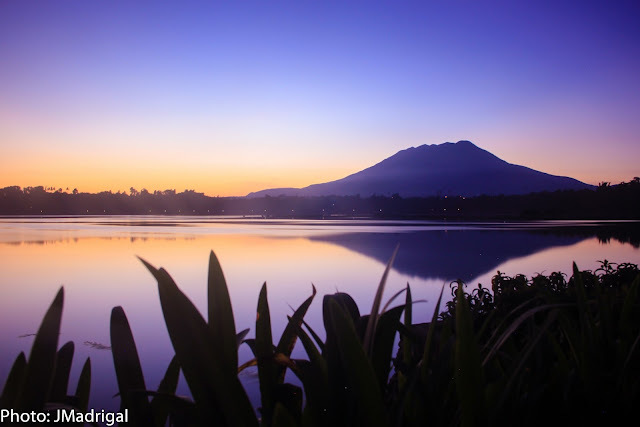 I had no idea where to shoot sunrise until one of my Facebook friends posted a photo showing sunrise at Sampaloc Lake in San Pablo City Laguna. Since I love sunrise, I had few days to prepare and I did some researches about Sampaloc Lake. I never tried shooting landscape through long exposure beyond 30 seconds. Just a day before the shoot I bought a shutter release for long exposure and a new tripod. I took the bus in Edsa through Lucena Lines on the night of August 3 and the travel time was short taking a one and a half time to my destination. I arrived San Pablo Medical Hospital which is the jump off point if you wish to go to Sampaloc Lake. Since it was only 1:45 a.m. I decided to stay at 7 Eleven store at the high way which is a walking distance from the hospital. Actually there are lots of 7 Eleven store in San Pablo City even when you cross the hospital there is one store there. At 4 a.m. I went back to the hospital because at the other side of the road on the left you can ride a jeep going to the main city proper where Jollibee and Mcdonald's operate 24 hours. I took a walk for 20 minutes till I reached the lake and waited for the sunrise. According to the locals and to my researches, there were 7 lakes in San Pablo and Sampaloc lake is one of them and the biggest lake among the 7. I immediately packed up at 7:30 after taking some breakfast in the park just near the lake. Overall the trip was fulfilling as shooting the sunrise is a seldom activity for me, compared when it's sunset. 1. There are buses at Edsa that go to Lucena, Quezon, you can ride Lucena Lines or JAC Liner. Lucena Lines is run by JAC Liner and has a free wi-fi access. 2. Tell the conductor to drop you off in San Pablo Medical Hospital, but I think that Lucena Lines go to the main city proper where you can stay either at Jollibee or Mcdonald's when you arrive at past midnight. 3. If you drop at the hospital, go to the left road and ride a jeep and tell the driver to take you to the Capitol which is the jump off point going to the lake. Tell the driver either to drop you in Mcdo or Jollibee. 4. Either you can walk going to the lake or ride a tricycle and if you decide to walk you call see the Municipal Hall and a park leading to Sampaloc Lake. I hope this helps but it's pretty easy to find when you get to the city proper.